The project seeks to give a clear identity to the triangular shape of Kilbride Park. It aims to do this by reinforcing the edges of the park. The Arts Centre will create a new Eastern edge. The inverted C-shaped plan of the Arts Centre aims to define the edge of the park while creating a visual link between the enclosed space of the inverted C and the triangle of the park. The Southern edge of the park will also be reinforced with a row of planted trees. Together with the existing trees at the North this will create a sense of full spatial enclosure. 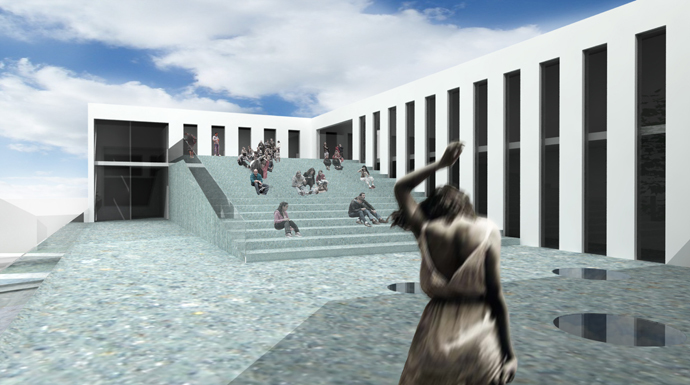 At the acute vertex of the triangle will be a pool of water with a water feature. Paths will be provided on all sides of the park, with one middle path dividing the water area from the grass area. 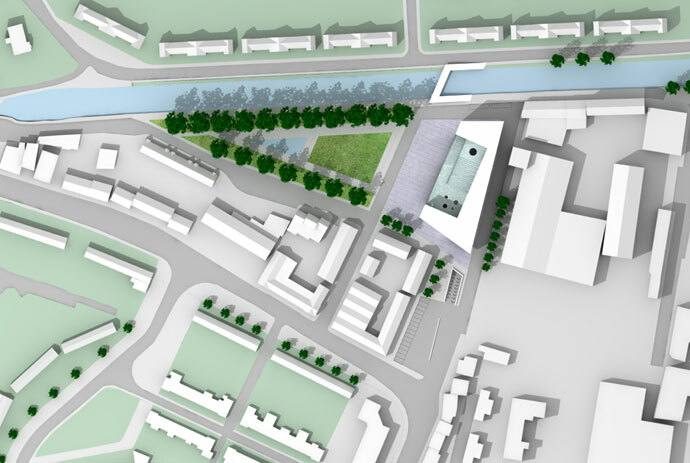 The northern end of St. Kyran’s Street will be straightened and will now lead to the new pedestrian bridge across the Grand Canal. It will divide the grass area of the park to the West from a paved new ‘Arts Square’ just in front of the new Community Centre to the East. The new ‘Art Square’, following the model of the square in front of the Centre Pompidou in Paris, aims to attract performers for some informal events to take place and to entertain the public that might be enjoying the park. The inverted C-shaped centre encloses an outdoor performance space at first floor level, located on the sloping roof of the internal auditorium. In this way a visual link is created between the park and the two external areas of the Arts Centre, the Arts Square at ground level and the open-air auditorium at first floor level. This allows open-air performances to be viewed from Kilbride Park. The internal shape of the enclosed auditorium is determined by the best acoustic shape for a rectangular plan. It will be enveloped by the wings of the main building, which act as the backdrops to the open air stage above. 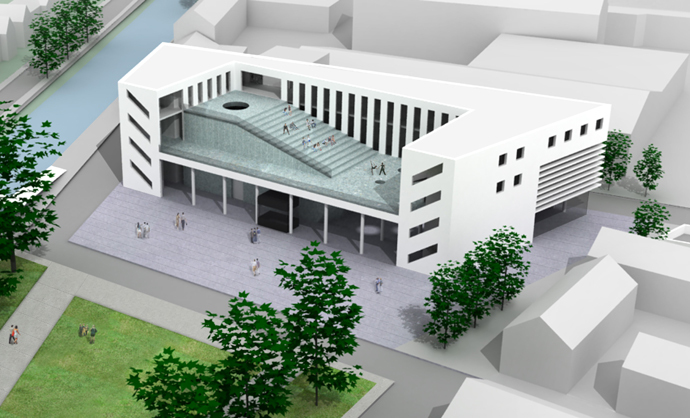 The ground level exhibition space will be lit by circular holes at roof terrace level, and by the large West facing glazed wall facing the park. The first floor Gallery space will have louvers to provide shading from any direct sunlight, yet still allowing views towards O’ Connell Street. Art Room 1 will have high level north facing windows that will allow views towards the Grand Canal and beyond, whereas Art rooms 2 & 3 will have both North facing windows facing the Grand Canal and will also benefit from roof lights. The proposed construction material of the walls will be insulated cavity walls rendered and painted, with double glazed openings. Floors will be constructed in reinforced concrete. The auditorium roof and roof terrace performance areas will be clad in green slate. This will give the building enough thermal mass in order to prevent strong daily and seasonal temperature swings. The building’s thermal mass will minimise heat loss in winter and heat gain in summer. The roofs will be insulated with compacted sheep’s wool insulation. Wool itself absorbs carbon dioxide from the atmosphere as it grows. During its lifetime, the average sheep absorbs more than 30kg of CO2 in its wool. In the UK, about 70m kg of CO2 is absorbed in the wool of the country’s sheep flock every year.